Micronesia with its capital Palikir is located in Oceania (Oceania, island group in the North Pacific Ocean). It covers some 703 square kilometers (four times the size of Washington, DC (land area only)) with 104,196 citizens. English is the official language used in Micronesia. Thiscountry has no land-based border with any other country. The topography is islands vary geologically from high mountainous islands to low, coral atolls with volcanic outcroppings on Pohnpei, Kosrae, and Chuuk. The average density of population is about 148 per km². The climate in Micronesia can be described as tropicalheavy year-round rainfall, especially in the eastern islands, located on southern edge of the typhoon belt with occasionally severe damage. Potential natural disasters are typhoons (June to December). To reach someone Micronesia dial +691 prior to a number. The local cellular networks are operated on 900 MHz, 3G. Websites typically end with the top level domain ".fm". If you want to bring electric appliances (e.g. battery chaarger), keep in min the local 120 V - 60 Hz (plugs: A, B). The sign for the locally used currency Dollar is USD. 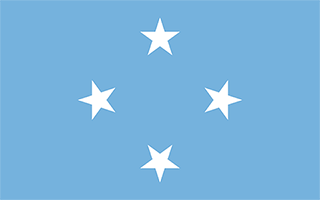 Light blue with four white five-pointed stars centered; the stars are arranged in a diamond pattern; blue symbolizes the Pacific Ocean, the stars represent the four island groups of Chuuk, Kosrae, Pohnpei, and Yap.